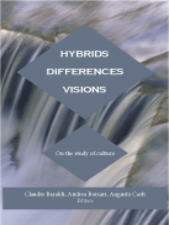 Title: Hybrids, Differences, Visions: On the Study of Culture Author: Claudio Baraldi, Andrea Borsari, Augusto Carli, eds. Imprint: The Davies Group, Publishers soft cover 286 pp. USD 28.00 ISBN 978-1934542262 June 2011 This exploration of the various fields covered by the study of culture presents different approaches to the relationships between language, culture and society, and focuses on the importance of culture in modern and contemporary historical studies. By applying a variety of new analytical tools and concepts, the contributors demonstrate the usefulness of interdisciplinary approaches—based on anthropology, communication studies, cultural studies, history, linguistics, and philosophy—in understanding the multi-dimensionality of culture. The volume contains four sections, each representing a different theoretical approach. Each section is introduced by an interpretation of the theoretical background of the papers that summarizes the original spirit and contents of the conferences at which the papers were presented. The studies presented in this volume not only share a common theme (“study of culture”), but also imply openness to confrontation and negotiation between the different theoretical approaches that are represented. Contents Cesare Giacobazzi, Introduction: On the Study of Culture Part I Andrea Borsari, Culture, Philosophy, Anthropology Michael Tomasello, Human Adaptation to Culture Christoph Wulf, Historico-cultural Anthropology as Centre of the Sciences of Culture Pier Giorgio Solinas, One Thing Leads to Another: Material Culture, Anthropology and Evolution Part II Claudio Baraldi, Intercultural Studies Jan Nederveen Pieterse, Global Multiculture: Cultures, Transnational Culture, Deep Culture Donal Carbaugh, Situating Cultural Studies in Communication: Cultural Discourse Theory John O’Regan, Death, Identity, and Discourse: Cultural Research at the Margins of Experience Part III Augusto Carli, Languages and Culture Marina Bondi, Other Languages, other Cultures Alessandro Duranti, Ethnopragmatics and Beyond: Intentionality and Agency Across Languages and Cultures Bernard McGuirk, Cultural Studies at “the Limits of Truth” Part IV Michele Nani, Historiography and “Culture” Dietrich Harth, Imperial Cultures and Cultures of Imperialism. The Case of India Robert Lumley, “Visual Culture” and Cultural Studies: Form, Genre and History in the Films of Yervant Gianikian and Angela Ricci Lucchi The editors Claudio Baraldi is Professor of Sociology of Cultural and Communicative Processes, Department of Language and Cultural Sciences, University of Modena and Reggio Emilia. He is Director of the Research Centre on Peace and Sustainability at the same University. Andrea Borsari teaches Cognitive Pragmatics at the University of Modena and Reggio Emilia, is visiting research fellow at the Centre for the Study of Post-Conflict Cultures (University of Nottingham) and managing editor of Iris. European Journal of Philosophy and Public Debate (Firenze). Augusto Carli is Professor of General Linguistics, Ethnolinguistics and Applied Linguistics Department of Language and Cultural Sciences, University of Modena and Reggio Emilia. His main research interests and publications are in bilingualism and languages in contact/conflict.